GAMDIAS, the leading gaming brand, today announced the release of their dual level RGB stream lighting optical gaming mice series which consists of three mice, ZEUS E1, ZEUS M1 and ZEUS P1. 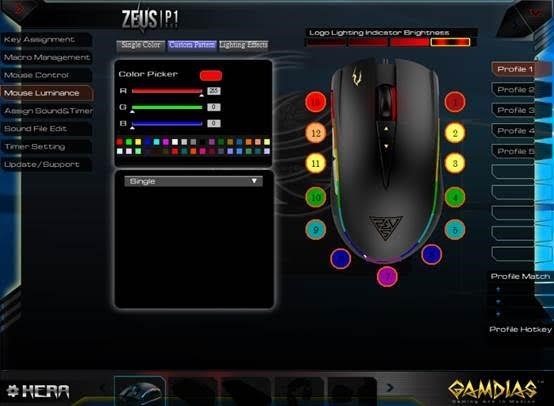 ZEUS P1 features 16.8 million dual level RGB customizable stream lighting design makes ZEUS P1 the most unique gaming mouse! ZEUS P1 dual layer stream lighting can be customized via 13 different LEDs, each one can be customized by our HERA software and has an unlimited number of customizable lighting combinations. Users can also save up to 5 profiles and change them anytime during their gaming session. The ZEUS P1 also comes with a 12,000 DPI optical sensor that provides pixel-perfect tracking and advanced surface calibration support. ZEUS P1 features eight strategically placed buttons which provide an advantage by customizing your button configuration and playing your way using our HERA software. ZEUS P1 gaming mouse offers consistently accurate tracking, eight configurable buttons, and super-responsive switches. Fully customizable Double level RGB streaming lighting creates a beautiful, personalized look that matches your style. ZEUS M1 features 16.8 million dual level RGB customizable stream lighting design like the ZEUS P1. With 6 pairs of customizable LEDs, and 10 types of lighting effects, you’ll have immense customization potential with the help of HERA. 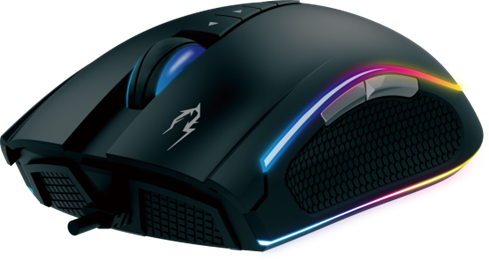 ZEUS M1 features a 7000 DPI optical sensor and adjustable tuning zones allow you to customize the weight of your ZEUS M1 to give it the feel you want. The ZEUS E1, packaged with the NYX E1 gaming mouse mat, comes in a classic shape, and is ergonomically designed to ensure a comfortable fit for any hand size. ZEUS E1 lets you play comfortably during extended sessions without any frustration. In addition, it features an on-the-fly DPI adjustment (1000, 1600, 2400, and 3200 DPI). Dedicated on-the-fly DPI adjustment buttons are positioned perfectly bellow the scroll-wheel for unbeatable access when in-game – allowing you to change your sensitivity without compromising your aim. Furthermore, ZEUS E1 switches provide a crisp clean click with a life cycle of 8 million clicks. The ZEUS E1 gaming mouse intends to compete as long as you do! Worldwide availability – Jan 2017.